On the 20th March 2015, staff and students at my current school gathered on the spacious sports fields to observe the first solar eclipse in this country since 1999. This was an excellent opportunity to bring students of all ages together to share their knowledge and the experience, from our 5 year olds in Reception to our oldest A Level students in the Upper Sixth Form. The school provided solar glasses for the students courtesy of Jonathan and Sarah Higginson, who kindly donated the glasses, in memory of their 10 year old son, who died in a traffic accident in 2009. George, was science mad, and especially loved astronomy. Consequently, his parents are raising money to purchase a telescope which will be placed in Williamson Park, Lancaster, for everyone to enjoy. The school collected monetary donations for the solar glasses which raised over 200 pounds towards the funding of the George Higginson Telescope. This was a fantastic learning opportunity for the whole school, with most teachers just as keen as the students to be outside and observing the scientific phenomenon. It is important to encourage authentic learning at every opportunity. 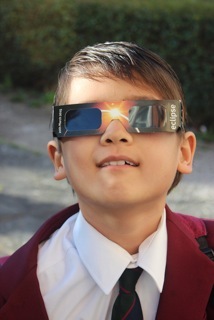 The students in the Junior School engaged in a great deal of research during the week in their science lessons about solar eclipses and a number of classes even made their own pin-hole cameras. Other classes decided to use colanders or telescopes to cast the shadow of the eclipse onto white paper. Senior school students wrote about solar eclipses in their English lessons after learning about how they have been perceived in literature throughout history. Meanwhile Physics lessons involved looking at the science behind the process of an eclipse and why they occur in different places around the Earth at different times. 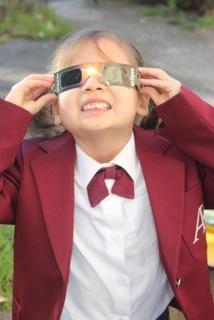 Although the weather was not favourable on the morning, the school did manage to glimpse the eclipse at different stages through small breaks in the clouds in the build-up to 9.31am. There was a great deal of excitement and dialogue taking place about what was happening amongst the student community. This was made more impressive and poignant as Senior School students facilitated learning as they buddied up and mentored the younger students from the Junior School to provide further explicit explanations. It was a successful and important coming together of the school community with everyone being positive and optimistic despite the disappointing cloud cover. You can see the impact a whole school community event like this can have here.